Hyper-V integration services, are a bundled set of software which, when installed in the virtual machine improves integration between the host server and the virtual machine. Integration services (often called integration components), are services that allow the virtual machine to communicate with the Hyper-V host. Hyper-V Integration Services is a suite of utilities in Microsoft Hyper-V, designed to enhance the performance of a virtual machine’s guest operating system. In short and general, the integration services are a set of drivers so that the virtual machine can make use of the synthetic devices provisioned to the VM by Hyper-V.
Hyper-V Integration Services optimizes the drivers of the virtual environments to provide end users with the best possible user experience. The suite improves virtual machine management by replacing generic operating system driver files for the mouse, keyboard, video, network and SCSI controller components. It also synchronizes time between the guests and host operating systems and can provide file interoperability and a heartbeat. Technically, the LHC is a simple Access database where it stores a subset of the data store in each Presentation (XenApp) server. The IMA service running on each Presentation(XenApp) Server downloads the information for every 30 mins or whenever a configuration change is made in farm. LHC primary functions are permits a server to function in the absence of a connection to the data store & improves performance by caching information of applications. LHC contain the information of servers, published applications, Domain & Licensing. LHC evolved a lot over the years and allowed SQL downtimes for an indefinite period in its last release with XenApp 6.5. If the data store is unreachable, the LHC contains enough information about the farm to allow normal operations for an indefinite period, if necessary. However, no new static information can be published, or added to the farm, until the farm data store is reachable and operational again. With the release of the awful version 7.0 of XenApp in 2013 and the move to XenDesktop FlexCast Management Architecture (FMA), Citrix decided to remove the Local Host Cache feature–and many others–without offering any other alternative. To be fair, Citrix converged XenApp into XenDesktop, which was already using the FMA design since the version 5 and without Local Cache Host equivalent. This decision immediately made the SQL infrastructure a critical piece of any XenApp implementation. Any downtime on the SQL infrastructure would immediately cause a downtime for new sessions on the XenApp infrastructure as well. It could also have some side effects with the old Citrix Web Interface. Citrix recommends having a highly available SQL infrastructure to host XenApp and XenDesktop databases. While you can successfully implement HA for your SQL infrastructure, it does not necessarily mean that you will avoid downtimes, as many components are to be considered. Facing a storm of complaints, Citrix also started–finally!–to listen to its customers and released XenDesktop 7.6 in Sept 2014 with the Connection Leasing (CL) feature enabled by default. Unfortunately, CL was not full replacement of LHC and it is alternative option provided in placement of LHC, limited to frequently used and assigned applications/desktops (up to 2 weeks by default). For users not using Citrix frequently or using pooled desktops, CL is completely useless and did not resolve anything. There are also many limitations: load management, workspace control, power actions are not supported. Citrix came up with a milestone achievement with its new idea as part of the XenDesktop 7.12 release in Dec 2016. This time, they claimed to bring back all the Local Host Cache (LHC) features from XenApp 6.5, even adding few improvements to make it more reliable. LHC feature is offered for Cloud and On Premises implementations along Connection Leasing in 7.12, but is considered the primary mechanism to allow connection-brokering operations when database connectivity to the site database is disrupted. Surprisingly, Local Host Cache feature is disabled by default. Let us expect Citrix to enable that feature by default in the next version. When installing XenDesktop 7.12 and up, a SQL Express instance(Local DB) will be installed locally on each Delivery Controller to store the Local Host Cache. Config Synchronizer Service (CSS) takes care of the synchronization between the remote database and the Local Host Cache (Local DB). The Secondary Brokering Service (Citrix High Availability Service) takes over from the Principal Broker when an outage is detected and does all registration and brokering operations. Local DB, which is a runtime version of SQL Server with a specific licensing that limits the usage of four cores. No support for Pooled desktops, which is a huge downside. New version of the Local Host Cache would not assure you zero downtime. There is also a delay before users can actually connect .When the remote database goes down, VDAs still have to re-register to the newly and ONLY elected Delivered Controller. It can result in users not having icons in StoreFront or users not able to start new sessions for a short period. Last year, Citrix introduced two new XenApp / XenDesktop servicing options, the LTSR, which stands for Long Term Service Release and the CR a.k.a. Current Release., In 2016, Citrix announced first LTSR of XenApp and XenDesktop 7.6 and in 2017 first LTSR for XenServer 7.1 that is available for download on Citrix.com. A valid Software Maintenance (SM) contract is needed to make use of the LTSR or CR servicing option. Any new release of XenApp/XenDesktop/XenServer will be labeled a Current Release. With the CR servicing option you can always make use of (install) the most recent XenApp and/or XenDesktop versions including all the latest enhancements and additions that come with it. Its release cycles are much shorter with a new version release being announced every three to nine months in general. Citrix recommends that large enterprise customers have a combination of Current Release and Long Term Service Release environments. All initial releases of XenApp/XenDesktop/XenServer will be a Current Release. There will likely be multiple Current Releases of a major XenApp/XenDesktop/XenServer version (i.e. 7.6, 7.6 FP1, 7.6 FP2, 7.6 FP3, 7.7, 7.8 ,7.9,7.11,7.13,7.14); however, there will likely only be one LTSR release of that version after that release is considered customer-tested and industry-proven (i.e. 7.6 FP3). How will the customer know if their environment is Long Term Service Release compliant? Citrix support and engineering have developed the LTSR Assistant tool which will scan your environment and compare your environment with the necessary LTSR components to determine if you are compliant. The tool provides a report that will outline the necessary updates to achieve compliance. The LTSR Assistant tool is available for download athttp://support.citrix.com/article/CTX209577. Will a customer running an LTSR compliant environment be supported if they also have non- compliant components? 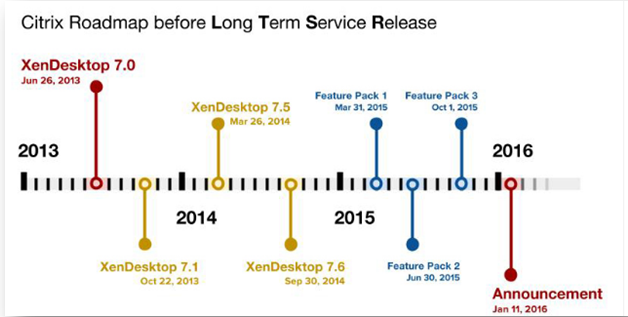 How often will Citrix release a Long Term Service Release of XenApp and XenDesktop or XenServer? Citrix will release a Long Term Service Release of XenApp and XenDesktop or XenServer based on the number of features, implementations, customer support cases and general feedback. However, as very general guidance it can be expected that Citrix will release a new Long Term Service Release every 12-24 months; however, Citrix reserves the full rights to alter those timelines. Is Citrix discontinuing the process of providing Hotfix Rollup Packs (HRP) for XenApp and XenDesktop? With LTSR, Cumulative Updates will replace Hotfix Rollup Packs (HRP). Hotfix Rollup Packs (HRP) will still be made available for XenApp 6.5. Will 7.6 LTSR support XenApp for Windows Server 2008 R2 for 10 years? Windows Server 2008 R2 will not be eligible for extended support. Citrix will continue to monitor Windows 2008 R2 lifecycle dates for future determination of lifecycle milestones. In one of our customer infra, for one of the VM ,snapshot grown to 1.9 TB size and it was created by one of the engineer as part of IS upgradation but forgot to delete. VM Role: Standalone critical VM where MS SQL(2008R2) databases are hosted and the size of all databases(100) is 1.3 TB. VM level backups are not existed due to backup license issue , however regular database backup is happening with backup tool . But, as on date SQL & backup team not tested restoration. Expected additional free space from storage as snapshot deletion activity requires equivalent VHD free space -> Due to storage credentials issue, storage team unable to provide any support. In a 5 node Hyper-v 2012R2 cluster, all of sudden VM backups are failing on only one node(HOST2) i.e., backup team unable to take backup if any VM hosted on HOST2. When backup team is firing VM level backup on the HOST2, Backup is getting terminated with the VSS snapshot error..
As issue specific to HOST2, tested VM backup with windows native backup tool -> Unable to take backup , terminating while creating VSS snapshot. Backup is working fine post fixing all..
Volume Shadow Copy Service (VSS) provides the ability to create a point in time image (shadow copy) that can be used to perform backups. In our environment, backup of VM failed immediately which was hosted on HOSt2 node, once it shows as “Snapshot Processing”. This means, snapshot operation is not happening. Provider ID(400a2ff4-5eb1-44b0-8a05-1fcac0bcf9ff) which is reflecting in Event viewer logs is related to MS CSV Shadow Copy Provider, which is not existing in registry editor as it might have unregistered. In one of my customer infra, we have 5 nodes in Hyper-v 2012R2 cluster. Among these 5 nodes , always Node1 changing to pause mode automatically for every 30 mins..
Node1 is going to Pause State(With DO NOT FAIL ROLES BACK) i.e., Node going to pause state without moving VM’s. Issue is getting resolve only after stopping of SCVMM agent service on BHHV-A01. I know that SCVMM is cluprit as issue resolving post stopping of SCVMM agent service -> I have asked customer to reinstall SCVMM agent on Node1 but he is not convinced. It has been observed that, SCVMM was installed with RTM version in and there is a known pause issue listed in Update Rollup 5. Check whether Disk owner in failover console is displaying current working Server or not , else you need to proceed all steps by logging to the disk owner server. In Failover Console ->Under Disk’s section -> Right Click Disk -> Assign to VM Role-> Select the VM which for which you want to assign. Unable to add Pass-through Disk in failover console to make Virtual Machine’s(2 VM’s) High Available with Pass-Through Disk. Multiple VM’s had pass-through disk’s and no issue with any other. One of my team member removed pass-through disk and shutdown as part of planned maintenance activity – Post VM start , Disk went into Read-Only mode in guest O.S. In Failover console-> Kept Disk into Maintenance Mode -> Added pass-through disk to VM in Failover Console -> Worked fine, Disk is in normal mode in Guest O.S. The node on which the resource is running restarts or loses communication with other nodes (which causes failover of all resources on that node). Before adding to cluster , when making DISK online -> Disk automatically coming with drive letter by appearing in windows Explorer -> Drive letter appearing as pass-through disk is not new(fresh), it is already using in production with drive letter so directly mounting. The UI(Failover Console) was trying to check the permission due to which we received an error on the disk which we are presenting as pass through as they are presented from SAN. 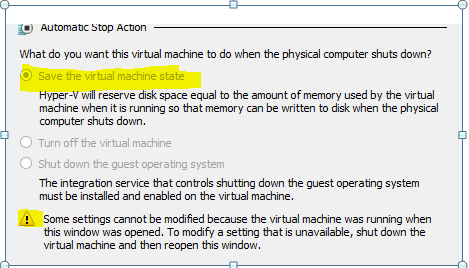 ‘Virtual Machine “DBL’ failed to start. The highlighted is the path of the disk on which we cannot add the permission. To force that path to get updated on the VM configuration file we have to run the PowerShell command.